The Chrism Mass is presided over by the Archbishop and concelebrated by the priests from all parts of the Archdiocese with parishioners from throughout the Archdiocese taking part. It is a sign of the unity and communion of the priests with their Bishop and a sign of the family of the diocesan Church celebrating together. At this mass, the priests renew their priestly commitment. 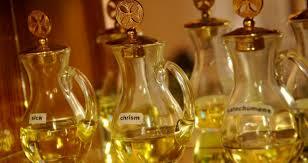 The blessing of Holy Oils is a central right in the Chrism Mass. The Oil of Catechumens for use in the sacrament of Baptism and the Oil of the Sick for the anointing of the sick. The Oil of Chrism is consecrated for use at the sacrament of Baptism, Confirmation and Holy Orders. Sacred Chrism is also used to anoint the altar and the walls of a new church at the rite of dedication. At the end of Mass, these Holy Oils are presented to representatives of all parishes who will present them to their parishes at the beginning of the Easter Triduum at the Mass of the Lord’s Supper on the evening of Holy Thursday. The Archbishop wishes to extend to all people of the parishes of the Archdiocese to celebration together at this joyous and significant Archdiocesan event.